Van Dyke is a privately owned site that had severe erosion of its 50 ft banks due, in part, to its exposure to a long fetch to the north of over 12 miles. The site is impacted with wind/waves from the northwest, north, and northeast and is defined as a bimodal site. The site's bimodal wave climate and sand rich banks called for a breakwater system which utilized the bank sand for beach fill. Several factors were important considerations in the design; these were impacts to adjacent properties and the coordination of 15 property owners with varying degrees of support for and input to the project. However, the 2,300 ft project was installed in 1997. The system consisted of eight headland breakwaters ranging in size from 90 ft to 160 ft with open upriver boundary and a low short 50 ft interfacing breakwater and revetment downriver. The project also included beach fill and wetlands plantings. Beach fill sand was selectively mined from adjacent 40 foot upland banks when they were graded. 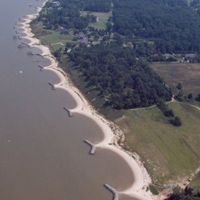 The overall purposes of the project were to provide shore protection and access to the James River.